A switch and interface in one. 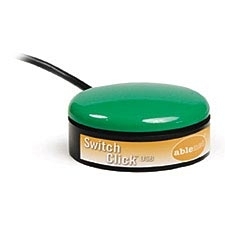 Simply plug this 2 ½-inch diameter switch into any USB port on your computer and press to simulate a left mouse click, while maintaining full access to your keyboard and mouse. Switch Click USB features an external switch jack to accommodate the switch of your choice. Simple adjustments allow it to send Left Click, Right Click, Space, Enter, Tab, and Arrow keys: Up, Down, Left and Right. Now you can have full access to two-switch scanning, any way you like. (Requires purchase of a second Switch Click USB).